Why Does Anything Become Trash? 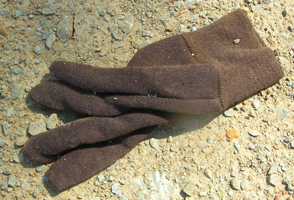 Recently, I found this glove left behind at a construction site. If I had dropped the glove, I would have picked it up. I’m not sure why a glove was in the area in the summertime. This week, there has been one shoe in the middle of Highway 70S in Bellevue. How does one lose one shoe in the middle of the road? When we did our trash pickup during the Great American Clean Up, I found a pile of clothes. Because they were wet and had partially been hidden by ground cover, I removed as many as I could carry in my bag. I see clothes a lot during my walks. Once I found a Titans baseball cap, which I brought home, washed and wore for a while. It was new anyway. I don’t think that it had ever been worn. I just can’t get used to our throw away society. If we have worn out t-shirts, we’ll use them for rags. If the clothes are still wearable, we donate them to Goodwill. At worst, we toss in the garbage. My mother used to give all all of our outgrown clothing and household goods to a family in my home town. I remember one Christmas visiting them with my mother. Our discarded Christmas decorations looked new and beautiful. Much of the furniture in the home was familiar to me. The home was one of the cleanest houses that I have ever visited. And I recognized some of the clothes. That’s one of my fondest Christmas memories. I’ve always found clothes while I’m walking, running or cycling. The only thing I ever brought home was a Tennessee Titans baseball cap. It was quite new and held up perfectly after I washed it. 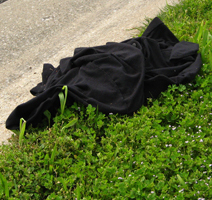 At first, I thought that the above clothing was tossed to the side, while moving a lawn or walking. When no one picked it up for a few days, I assumed it was just dumped. Please take unneeded clothes to Goodwill or cut them up and use as cleaning rags. 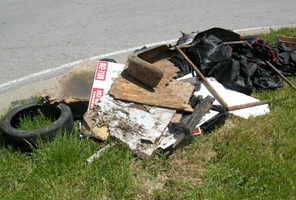 Here is the pile of trash we collected yesterday. There is at least one tire, two car bumpers, towels, clothes, roofing shingles and similar debris from the spring storms in the area, signs, tons of bottles and cans. There were some gas tanks from cars, but these were very old and w ere embedded into the ground. For the dozen or so folks involved, we did a great job. A find I found amusing was a polo shirt with a TA logo on it. This is an inside joke for my coworkers, who used to work on a TA magazine. We spent about 2.5 hours picking up this trash along about 2 miles of roadway. We’re proud that we are part of the Great American Clean Up and can’t wait to see the total statistics of trash collected for the country. We would be prouder if we didn’t have to collect trash dumped by our fellow homo sapiens. It’s impossible to participate in a road race with 32,000 people and not make a mess. I could have taken all my fluids with me, but I wanted to pack as few extra pounds as possible. Since it was raining before the start, I abandoned my orange plastic “rain wear,” designed for one time usage at football games, at the start where the announcers assured me that the plastic rain gear, which many runners were wearing, would be picked up and discarded. Along the first mile, I saw lots of nice clothes tossed to the side of West End Avenue. I’m sure that the homeless in the area picked them up. At least, I hope they did. Luckily at the Accelerade and water stations, paper cups were being used, but tons of plastic bottles from Daily’s and Accelerade were the sources of the liquids. I hope that Metro Nashville Public Works recycled all those plastic bottles for 32,000 runners and walkers. I tried to toss the cups into the trash cans, but I never made a hit. This afternoon, we drove over the first mile of the course, and the trash was gone. Thanks, Nashville, for a great race. Tomorrow, I’ll become a conservationist again. I didn’t like trashing the roads.